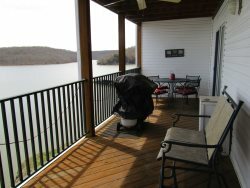 Great condo with direct access to pools and fishing docks. Golf nearby. Clearwater Condominiums are located at the 8.5 mile marker on the Big Niangua branch of the Lake of the Ozarks. This is called the 'quiet' end of the lake, a great area for boating, water skiing, fishing or just cruising and relaxing. This is a family friendly place - conducive to fun and good times. Within a few miles from the condo complex, you can find just about any activity or shopping need that you may require. Two fine golf courses, Old Kinderhook and Lake Valley Golf Club, are located just a few miles away. The city of Camdenton is just 4 miles to the east. For additional activities, attractions and shopping, the larger city of Osage Beach is only about 15 minutes away. Complex offers pool and access to docks for fishing. Very Friendly staff. We visited for a bit with several people in the office. They were helpful and eager to give us information. Absolutely Wonderful! We enjoyed our visit so much. The property was great! The two bedroom was perfect for 6 people. The beds were great and the kitchen had everything you might need.